Kenzie has been referring to herself as "The Princess" so it was the perfect time to take her shopping at Walmart for The Little Mermaid toys. However, since she has been with fever and went to the doctor, I went on my own - check out my outing here! The Little Mermaid is one of my favorite Disney princess movies, not only because I actually wanted to be a mermaid at one point during my childhood, but also because of Ariel's fun adventure with her pals Sebastian and Flounder. Bath time was a nightmare when Kenzie was a wee one and I am so glad that she now enjoys swimming in her pool. I turned on The Little Mermaid's Under the Sea song on my phone and showed Kenzie how to use her Princess Bubble Wand. We dipped it in bubble bath and The Little Mermaid swam in her sea while blowing bubbles. I told Kenzie the story and we had a grand time. It's the little moments that I can cherish with Kenzie that count. During the hectic week it's difficult to have bonding time other than just the normal dinner and minimal play time before it's time for bed. This little luxury of splashing and playing with a classic tale was fun for us. She seriously did not want to get out of the tub! The Little Mermaid Bubble Wand takes 2 AAA batteries which are not included. However, since we are masters are borrowing from other electronic devices in our home, Kenzie was set. When I asked Kenzie how she knew of Ariel, she mentioned that her preschool friends had the dolls. She has already asked me to take her to check out the Ariel and other Disney Princesses selection at Walmart. Let's just say that I am going to go this weekend to pick up a few more Disney Princess toys with my little princess as well as the movie so we can have an Under the Sea viewing party! 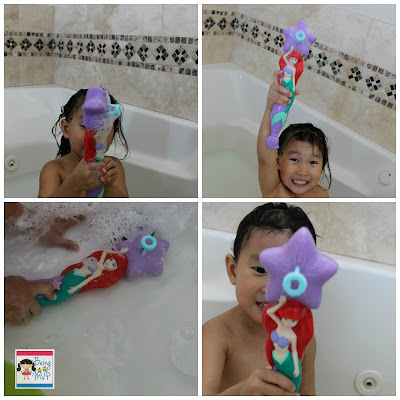 Check out the Under The Sea Pinterest Board for more great The Little Mermaid playdate ideas! Make sure to connect with Disney on Facebook and Twitter! 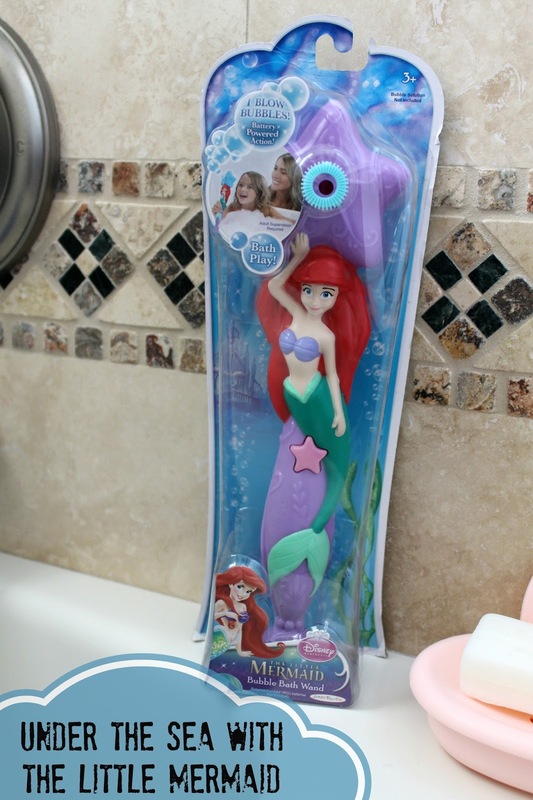 What a cute toy, I have always love the Little Mermaid. This looks like such a fun bath toy! Even though it's a mermaid, my grandson would still love to play with it! What a fun toy! I need to get one of those for my daughter soon!